The love affair between fashion and opera is a passionate one. While we obviously love La traviatafor its beautiful music and heart-breaking story, one of the highlights of this production is its visual appeal, and in particular the beautiful period costumes. Whilst Verdi himself wanted his opera set in 1853 (the year he wrote it), he was forced to move the action back a century and a half to the time of Louis XIV, complete with long curled wigs, balloon breeches and buckled shoes. That is how Verdi saw it on stage and that is how it was performed until 1906, five years after his death. Fortunately we can now enjoy Verdi’s opera as the great composer intended – a remarkable love story set in his own remarkable time. Set in mid nineteenth century Paris, the costume designs reflect this exciting time in the fashion world, with female styles almost exclusively originating from the French capital (masculine styles were more associated with London). The early 1800s had seen the opening of department stores, which had given an additional boost to fashion sales. Instead of courtiers, France now had the bourgeoisie and, as the driving force that made the economy move from hand to hand (as in, they could actually move money around), French fashion found its way into society. A typical skirt of the 1850s was dome-shaped and supported by crinoline petticoats; its slight reduction in size was concealed by the addition of flounces edged with embroidery, a printed or woven pattern or velvet bands. As the decade progressed evening dresses were trimmed with more and more ruches, puffs, ribbons, flounces and lace. The mid-nineteenth century lady was a vision of elegance and grace, combining ‘uncomfortable and inconvenient’ with ‘frivolous and decorative’ to conform to the fashion of the day. The finished look was of elegance and grace with an illusion of ease and comfort. 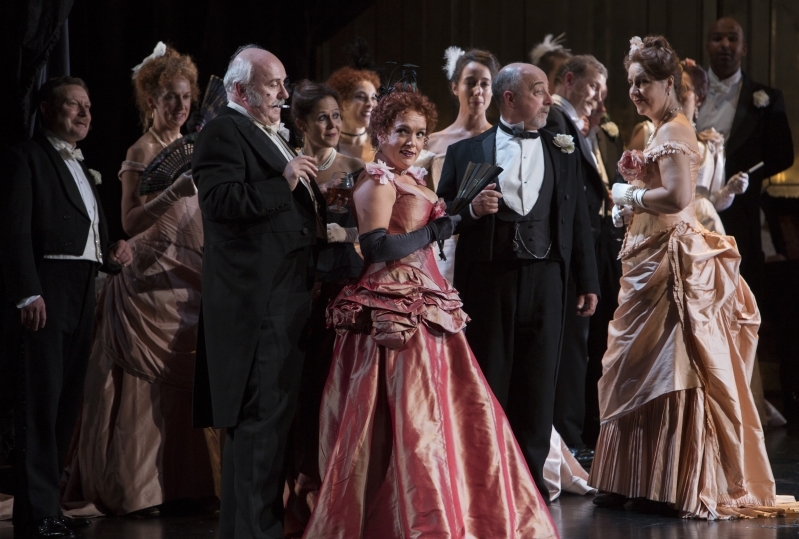 The costumes in La traviata are simultaneously luxuriant and intimate, modelled with exquisite attention to period detail on the fin de siècle Paris. Making a spectacular entrance to the Act I party scene, the demi-monde women are in emerald and sapphire, with touches of blood red, hinting at Violetta’s illness. The style in Act II, Scene II is very different to the style of Violetta’s party at the beginning of the opera, the ladies all wear sugar plum and the men are in tails. The beautiful long corsets and bustling trains, the layers, the thrill of what lies beneath. Predominantly dark costumes and fabrics convey both the exuberance and elegance of this hypocritical moralising yet whoring society. Violetta’s sequence of dark, white and red frocks represents the different aspects of her personality as seen by Alfredo: the damned courtesan, the selfless angel and the seductive temptress. If La traviata is the ultimate romantic opera, this is the ultimate romantic fantasy of a production. This production of La traviata was first performed by Welsh National Opera in 2009, and was directed by David McVicar. This is our 4th revival of La traviata, with Sarah Crisp returning as revival director for the 2nd time.